Biarritz And St. Jean De Luz are. Filet of Sole is the quickest fish to cook so it gives your mind time to think what to couple it with. Cilantro, fresh coriander as it is widely known will accentuate the noodles passed into browned butter mixed with steamed carrots, string beans sweet peas and topped with an Armagnac sauce. Armagnac brandy is as delicious for some, just as Cognac is for others. 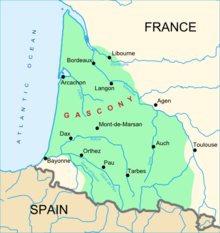 Armagnac is produced in the Region of Gascony, South West of France shown in phtoto above Courtesy of Wikipedia on Google. - 6 fillets of sole, thawed and patted dry. - 300 gms. of egg noodles. - 4 Tbsp. unsalted fresh butter. - 1 small onion very finely chopped. - 1 garlic clove very finely chopped. - 2 Tbsp. fresh coriander thinly chopped. - 4 Tbsp. thick Greek yogurt 10% fat (instead of cream 35% fat). - 1/2 cup of baby carots cut small. - 1/2 cup of string beans cut small. - 1/2 cup of sweet peas. - Juice of 1/2. lemon juice. - Salt and freshly ground pepper. - Add milk in a skillet, quickly cook the sole filets on high heat for 1/2 minute each side. Transfer fish onto a plate. Leave juices in skillet. Set aside. - Steam cook frozen baby carrots, string beans and peas till crunchy Set aside. - Add half of the butter in same skillet you cooked the sole in (with liquids in), stir fry garlic and onion then lower heat. - Add yogurt, stir to blend then add Armagnac, stir. - Add veggies and incorporate into a homogenous sauce. - In a separate skillet, brown butter, add boiled and strained pasta and stir in butter to coat until that beautiful aroma is let out. - Add sauce / veggie mix to the pasta mix well and transfer the lot in an oven proof baking dish. - Now, add the pieces of filet over the pasta and press 1/2 lemon's worth of juice over the fish. - Grill in oven for 5 minutes maximum, sprinkle the cilantro and serve.